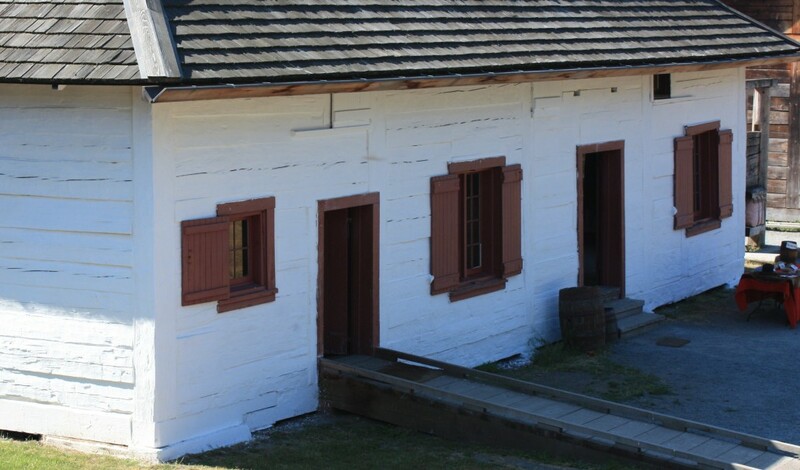 Fur trade warehouse at Fort Langley, the same as found in any fur trade fort, including the Peel’s River post. 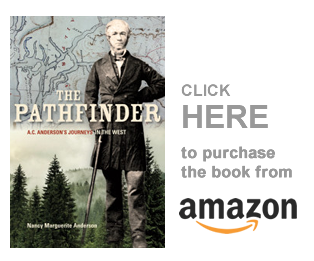 In the book, Two Journals of Robert Campbell, Early Journal – 1808 to 1851, Chief Factor Robert Campbell briefly described his crossing of the land portage from LaPierre’s House, on the Porcupine River, to Peel’s River Post, on the lower Mackenzie River almost at its mouth. His description is very brief and his journal ends at this point, but there is lots more to tell you. We arrived at the head of navigation, Lapierre’s House, the Depot for the goods carried over the mountains in winter on dog sleds from the head waters of Peel River, an affluent of the mighty Mackenzie. The fur packs were stored there to be transferred in winter, & the Youcon outfit which had been rendered there from Peel River during last winter was loaded into the Youcon boat & sent back on the return trip at once. Mr. Murray & family, myself, & some of our men started on our walk over the mountains, to Peel River Fort. On our second day, I think, we reached the barren ground, where not even a bush grows. As you know from the last post, found here: http://nancymargueriteanderson.com/peel-river-post/ he did write of this journey across the mountain range, and his arrival at Peel’s River Post. But now I have another gentlemen who gave a good description of his arrival at Peel’s River, as he came down the Mackenzie River to take charge of this post in the fall of 1847. He and his “motley crew” made their way up the muddy Peel River, with the men wading through the mud to bring the loaded boat upriver. “We pitched our last encampment on its muddy banks under the shade of a few stunted pine trees,” he wrote. They had each a weapon in hand and at the command of their chief Grand Blanc — so called I imagine, in contradistinction to his dark and grim visage — who, like a general commanding his troops was seen running hither and thither, arranged in a brand new bright frock-coat with bright tinsel facings; his legs encased by a pair of white trousers and his head surmounted by a flaming high peaked scarlet worsted cap! Instantly “falling in” they stood in a line along the front stockade with arms presented, dancing and singing to slow time, and just as the boat struck her prow in the soft mud they discharged a very irregular volley and blank cartridge and then came rushing pell-mell down the bank to gaze at me and also to assist in unloading the boat and storing the goods. Six inches of tobacco being presented to each, their joy knew no bounds, and in five minutes the dense foggy atmosphere was rendered still more so, by the volumes of tobacco smoke emitted from a legion of pipes. I find the author a little racist, but he was writing this manuscript for publication in England, where they would have the same attitudes. It was also written in the early 1850s, when racism was accepted. Still, he gives a good picture of the First Nations people he met and traded with. He goes on to describe the Peel’s River post, giving a little bit of its history in the process. This post formerly stood lower than its present situation. The lowness of the site, which was liable to inundation as well as other causes, required its removal to its present position. It stands high and solitary for the want of wood close at hand, but in this respect we have no choice for a dry spot of ground along the banks of the Peel is a miracle. The country on all sides, far and wide, is one extensive morass covered by pine trees and dotted by countless lakes and ponds which afford a retreat to myriads of muskrats. The only trees which flourish in such a soil are pine, poplar, and birch, with willows of various kinds. It is only in some favored localities that lumber of middling bulk — about sixteen inches diameter is the largest found — grows. I wonder how they found the wood to build the post? Almost certainly they would have solved that problem by cutting timber upriver and floating it downriver on the Mackenzie. In such a soil, which does not thaw during the summer more than a foot in many places, the rearing of crops and vegetables is entirely out of the question; but even was the soil good, the climate would preclude that highly desirable object. Spring may be said to commence here about the middle of May. June and July constitute the summer. August and part of September the autumn, and the rest winter. Fancy, reader, a winter of nearly nine months duration and a summer of only two! Vegetation is very rapid once it begins but scarcely have the leaves on tree and shrub attained maturity ere the nipping frosts of autumn destroy them. They fall to the ground with a blighted and particolored tint. In the midst of winter the sun on the other hand denies us the sight of his feeble rays as it does not rise above the horizon. In those “days,” if I may be allowed the term, the daylight does not exceed three hours; so that, as in summer we experience endless day so in winter we have almost endless night! We therefore lead a somewhat monotonous life, somewhat analogous to that of a bear, and as grease is too scarce an article to allow us to burn candles at will we either sit peering through the gloom of firelight, or else sleep the time away. O happy state of existence! The next morning we get up and before we can gobble down a hasty breakfast the gloomy pale of a twenty hours’ night again surrounds us. These long nights, however, have their use; for, as we sleep most of the time the long winter does not appear so long as it otherwise would. The cold during this great length of time is very variable; seldom above zero and sometimes sixty degrees below it! Generally speaking the coldest months are December, January, and February, though I have sometimes seen New Year’s Day so mild that fires were dispensed with part of the day, and the snow quite watery. At that time it always blows more or less violently from the west and the weather is quite softy and balmy. The prevailing winds here are NW (moderate) and SE (bitter). New Year’s Day on another occasion will be so severe that we can scarcely keep the houses warm in spite of the heaps of wood piled on the fire. The goods for the western posts, Forts Selkirk and Yukon, on the Yukon River, are brought hither by boat from the depot and are transported in dog sledges in winter across the Rocky [Mackenzie] Mountains, which proves a tedious and miserable trip to those engaged in it. Due to the scarcity of wood the trip is rendered bleak and somewhat dangerous, and the distance to Rat Portage, which is on the west side of the mountains, occupies the loaded sledges for five or six weeks. On a calm day in the month of April a very pleasing view of picturesque scenery is obtained. When on the summit of the mountain pass, where not a branch nor even a twig of wood is to be seen, let the observer look in any direction, nothing meets his gaze but an endless sea of snow capped mountains and rugged peaks. It is, however, a dangerous locality, as the wind is liable to rise at any moment and it not infrequently happens that the voyagers are caught in a violent storm of wind and sleet as it sweeps along those bleak and dreary mountains, whirling up the slopes and enveloping the country in a cloud of drift. I was myself taken in a storm there once with my people, and although we marched in single file so thickly was the snow powdering about us that I could not even see the next sledge just before me, sometimes; and but for the fact that I felt the hard ground under my feet I could have fancied myself floating in the clouds. On such occasions one is oppressed with a choking sensation at intervals. As the wood is very scarce, small encamping houses are constructed at intervals along the road, the better to economize the wood and render the men more comfortable. ON arriving at one of these houses situated at the foot of the mountain peak we had some difficulty in finding our abode, as a previous storm of wind and drift had buried it under the snow. After some poking and shovelling, however, we managed to find the chimney, which guided us to the door, and we rendered it habitable by clearing out the snow and kindling a fire…. It was obviously not an easy route in winter time, yet the goods for Fort Selkirk, on the Pelly River, and Fort Yukon, on the Yukon River, were sledded across the mountains to Lapierre’s House where they would be picked up in springtime. But in 1852, as we know from reading the Fort Selkirk post journals online, the Chilcats attacked the fort and destroyed it. That story will be told, in Robert Campbell’s own words, in the next post, and many questions asked by the Yukon researchers, who transcribed and published these journals online, will be answered.